42 • RV PRO • November 2018 rv-pro.com O P E N H O U S E C O V E R A G E Grand Design Momentum G-Class 28G Building upon its reputation as a top builder of quality fifth wheels and toy haulers, Grand Design has moved into another towable category with the introduction of its Momentum G-Class travel trailer toy hauler. 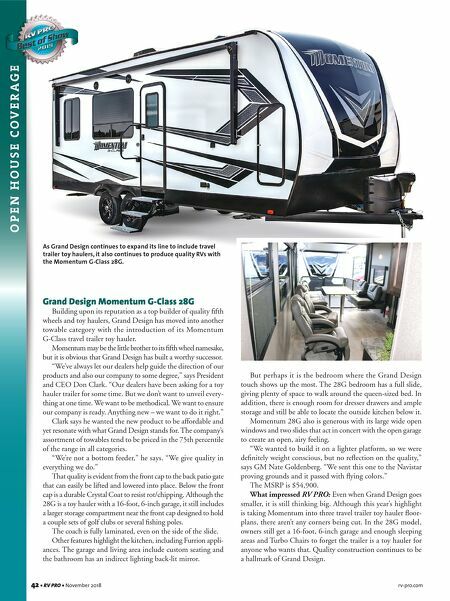 Momentum may be the little brother to its fifth wheel namesake, but it is obvious that Grand Design has built a worthy successor. "We've always let our dealers help guide the direction of our products and also our company to some degree," says President and CEO Don Clark. 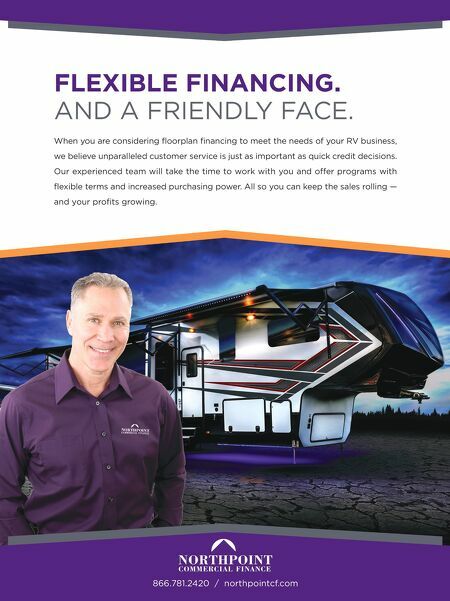 "Our dealers have been asking for a toy hauler trailer for some time. But we don't want to unveil every- thing at one time. We want to be methodical. We want to ensure our company is ready. Anything new – we want to do it right." Clark says he wanted the new product to be affordable and yet resonate with what Grand Design stands for. The company's assortment of towables tend to be priced in the 75th percentile of the range in all categories. "We're not a bottom feeder," he says. "We give quality in everything we do." That quality is evident from the front cap to the back patio gate that can easily be lifted and lowered into place. Below the front cap is a durable Crystal Coat to resist rot/chipping. Although the 28G is a toy hauler with a 16-foot, 6-inch garage, it still includes a larger storage compartment near the front cap designed to hold a couple sets of golf clubs or several fishing poles. The coach is fully laminated, even on the side of the slide. Other features highlight the kitchen, including Furrion appli- ances. The garage and living area include custom seating and the bathroom has an indirect lighting back-lit mirror. But perhaps it is the bedroom where the Grand Design touch shows up the most. The 28G bedroom has a full slide, giving plenty of space to walk around the queen-sized bed. In addition, there is enough room for dresser drawers and ample storage and still be able to locate the outside kitchen below it. Momentum 28G also is generous with its large wide open windows and two slides that act in concert with the open garage to create an open, airy feeling. "We wanted to build it on a lighter platform, so we were definitely weight conscious, but no reflection on the quality," says GM Nate Goldenberg. "We sent this one to the Navistar proving grounds and it passed with flying colors." The MSRP is $54,900. What impressed RV PRO: Even when Grand Design goes smaller, it is still thinking big. Although this year's highlight is taking Momentum into three travel trailer toy hauler floor- plans, there aren't any corners being cut. In the 28G model, owners still get a 16-foot, 6-inch garage and enough sleeping areas and Turbo Chairs to forget the trailer is a toy hauler for anyone who wants that. Quality construction continues to be a hallmark of Grand Design. As Grand Design continues to expand its line to include travel trailer toy haulers, it also continues to produce quality RVs with the Momentum G-Class 28G.